I love hiking in skirts, but before now it’s always been a warm weather endeavor for me. 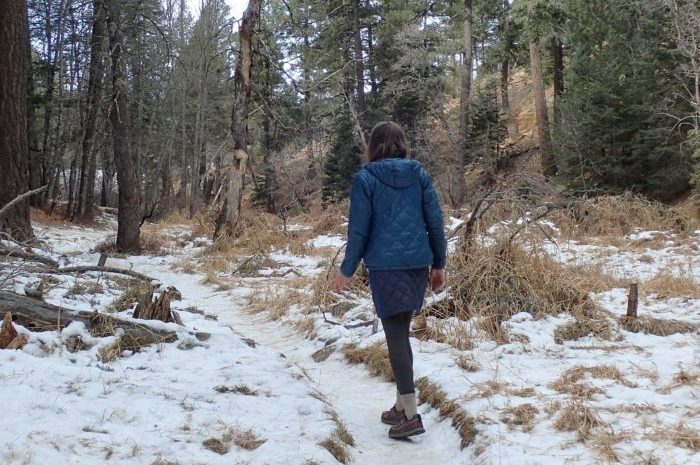 With its serious warmth, the Montbell Superior Down Trail Skirt is a perfect skirt for hiking in cold winter weather. 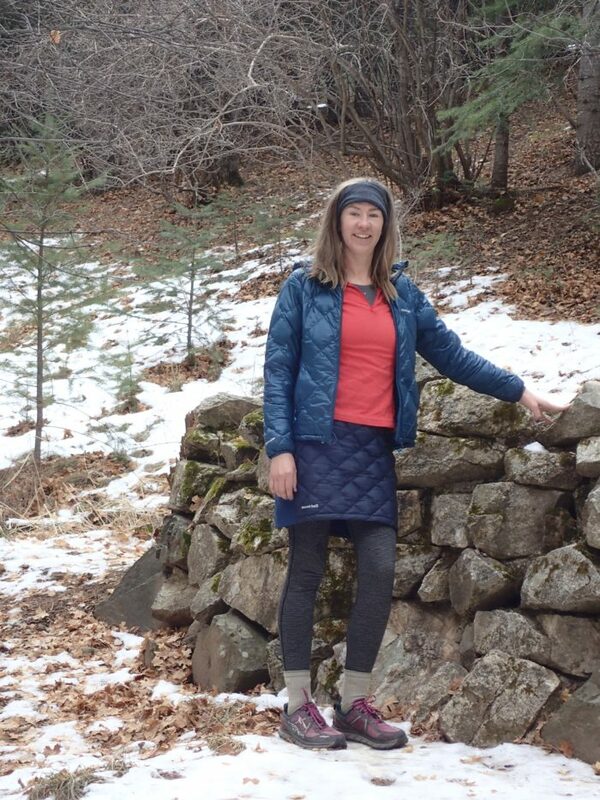 For a slightly less toasty insulated skirt on those chilly-but-not-freezing hikes, check out my review of the Thermawrap Trail Skirt. Aside from taking this skirt on plenty of mountain hikes in cold weather, I also took it out for an overnight trip so I could compare how warm it was with or without physical activity as well as in the colder nighttime temperatures. This skirt is really warm, and noticeably warmer than the synthetic Thermawrap, despite weighing only a couple of extra grams. Paired with leggings, this skirt kept me warm and cozy in below-freezing temperatures even when I wasn’t burning a lot of body heat. The stretchy sides keep the skirt secure while moving, which helps avoid too much of a draft, but still allow for wide range of motion in the legs, important for hiking. With stretchy sides and a stretchy waistband, the Superior Down Trail Skirt fits comfortably and stays snugly in place. There are no buttons, zippers, or seams to dig into or rub against your hips. The skirt isn’t so long it gets in the way, but it’s long enough to really keep your upper legs warm. Finding ultralight hiking gear that is warm enough to use in winter weather can be a challenge. Any opportunity to lighten the load when trudging through snow can help fend off fatigue. At only 4.2 ounces, the Superior weighs less than some of the hiking skirts I use in warm weather. Still, it’s the warmest bottom layer I have. Down offers many advantages, and is the reason why the skirt is so warm and light. However, from the perspective of a thru-hiker, down is a material that needs special care and protection from wet weather. Getting the skirt wet would limit its insulating ability. Therefore, this down skirt is probably not the best choice for a daily-wear item on a thru-hike. However, it is perfect for cold day hikes and backpacking trips with dry weather. The pocket on the skirt is great, easily accommodating a phone, wallet, or other essentials. However, I often found myself reaching to put both my hands in my pockets in the cold weather only to realize there was just one. Since this is a cold-weather piece of gear, having pockets to warm up my hands is nice. This skirt would be practically perfect if it had two pockets instead of just the one. At $79, this is an expensive skirt. However, considering it is made with high-quality down, the price tag is reasonable. 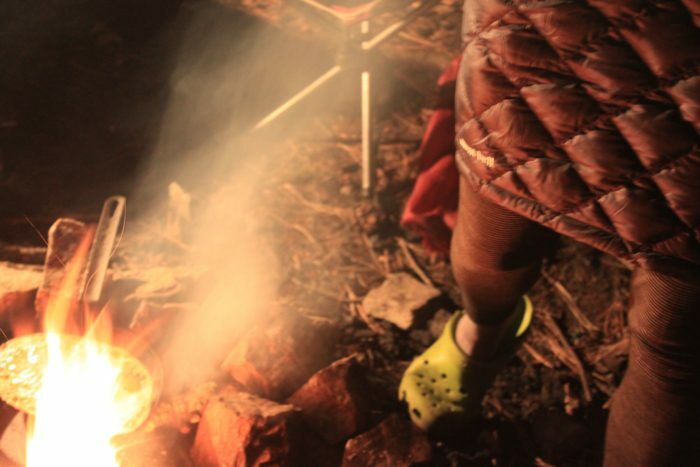 Plus, it’s a great piece of gear to add to your winter ultralight hiking kit. 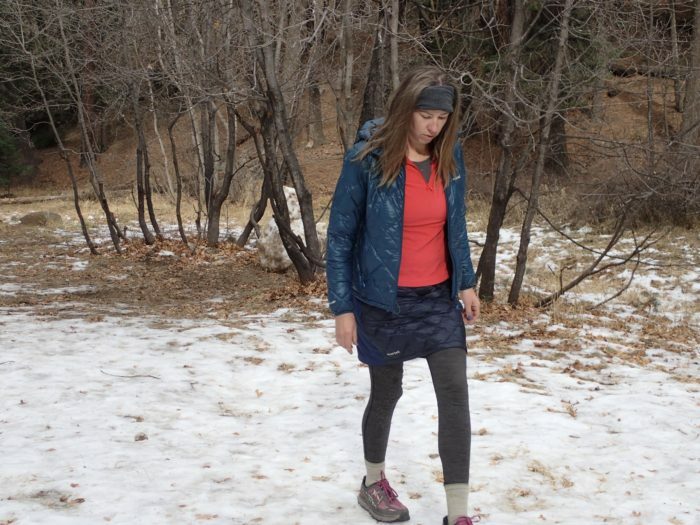 For winter-season hiking, this is a comfortable, warm, functional skirt. I have to give a shout-out that it doesn’t come in the standard “girl” colors of teal or purple, instead just “normal” navy blue or black, and I really like the navy. In fact, this skirt is now my go-to for hiking when the weather really gets cold! Disclaimer: The above product was donated for the purpose of this review.